Boy, I sure hope they re-issue the others as well. To think that I balked at paying $40 or so for them when they were new... I moved fast enough to pay not much more than that for "Fellowship" after it went OOP but more than I would have liked for "Return of the King".... and I made sure to buy the CDs for The Hobbit trilogy from Amazon when they were new, having learned my lesson (although I'm not sure how much I would have cared, in hindsight)... but I am not going to pay $200 and up for "Two Towers," no matter how much that hole in my little Shore LOTR collection bugs me. A reissue would plug the hole quite nicely! I don't know but I don't still believe $80 is the final price. This is now listed as £64.99 in U.K. (Amazon). Still quite expensive for 3 discs and 1 blu ray, I think this may come down before the release date. I missed out on the sets last time, no way would I pay the prices on the secondary market, so this may still be a cheaper option even for the current price. I got these sets over three Christmases just after they had been released individually and available from Amazon. 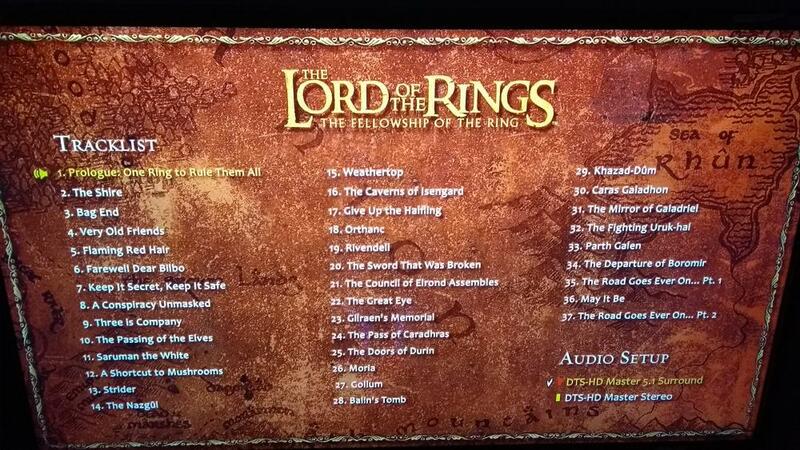 As I recall FOTR and the TT were selling at $80 with ROFT at $90 (it is a five discs in total). Those prices may fall, however if I were you I wouldn't wait too long to pick them up. I know this may seem like a silly question, but is there any difference in what retailer we use to purchase these from? Amazon? Best Buy? Walmart? One thing that bothered me about the original release on the DVD is that you couldn't pause the song, or rewind or fast forward. The music quality is great, but when I have it on in the background and need a pause for a moment to take a call, I can't pause the track, so you have to mute it, then when you unmute it, you can't rewind the track. Hopefully they fix this (if they can), as it is very annoying. 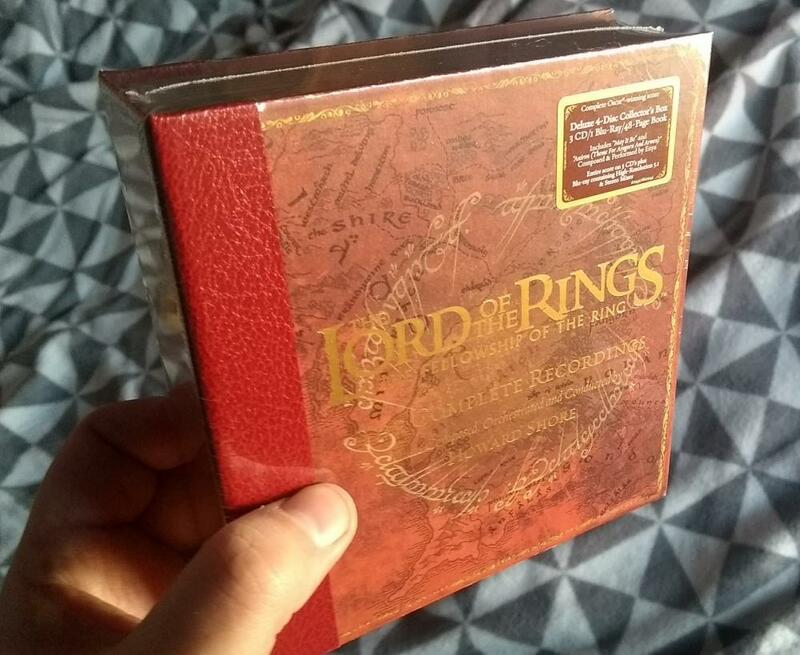 When I was listening to specific leitmotifs with my dad in his theater, we wanted to jump right to those themes, but couldn't on the DVD version, so we had to settle for the audio CD. Apparently some people in the UK received their copies today. Anybody here have theirs yet? Not yet. but it's imminently soon! So just waiting a little longer. I have all three CR sets signed by Shore, but I'll buy this reissue too - there is a Blu-Ray-Audio disc! Actually, the list price did go down. I purchased the vinyl set for $94.69 and the CD set for $58.19. I purchased both items from a local brick and mortar Big Box store. Amazon's still listing it at 79... Maybe at the exact release time could it change? Mine arrived today. Looking at it on the shelf. Not had time to play it yet, but it looks like the previous edition and yes, the rubber nub is still there. Shame they didn5 listen to all the negative comments about that nub and change it for this release. Looking forward to giving the Blu-ray a spin over the weekend. Has anyone received shipment notification from Amazon? Any change on the price? So it is certainly the same package? Awsome pictures of the set! Would be nice to get some info on the dynamic range / quality of audio. I assume quality hasn't changed, it's only offered in a different package. And DTS HD-MA is on par with PCM, merely a different container. The vinyl set is absolutely stunning and the sound is just superb. I'm hearing bits and pieces that I hadn't heard before. What a great collection! For those who purchased this first vinyl set, does anyone know if Rhino has any plans or would be willing to offer a mechanism, for us to pre-order matching set numbers for the second and third sets when they become available? From a collector's standpoint, it would be really neat to have all three sets with matching numbers. I'd even be willing to pre-order the next two sets directly from Rhino if it would guarantee receiving a matching numbered set. Thanks for your help! Has there been any remastering in this "reissue" ?? ?